There are plenty of ways to adorn your nails with excellent nail art. Newspaper nail art is one of the simplest and coolest nail art. The theme is very simple. 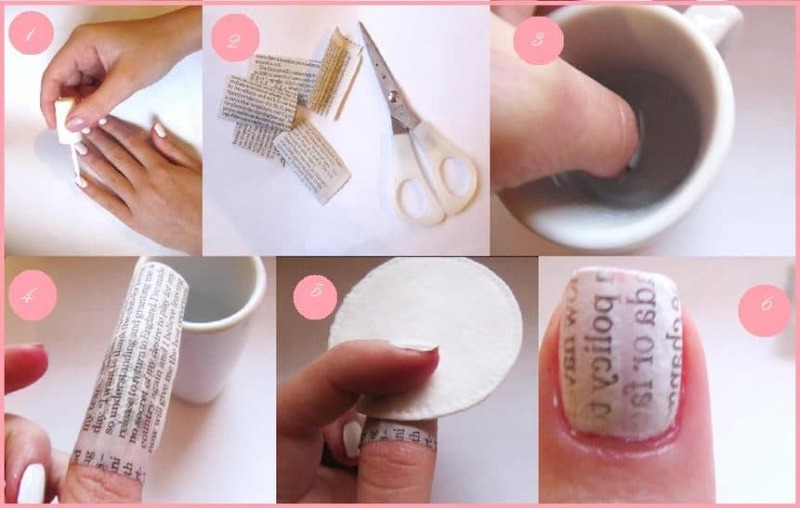 Transfer the inscription of a newspaper to the nail plates and enjoy the beauty of newspaper nail art. Learn how to do newspaper nail art from the below paragraph. Newspaper nail art gives a sophisticated look when it’s completely the opposite in respect of the application process. You’ll be stunned to know the simple ways of having newspaper nail art. Even you don’t need much of the supplies to get the nails done with newspaper nail art. Along with the regular manicure products, you will need just a bottle of rubbing alcohol, especially for the newspaper nail art. Some girls also use water instead of alcohol. Well, that means you can have newspaper nails with water too. Here are the ways how you can do this nail art. Apply a white color to your nail plates. Cut a newspaper into tiny pieces. Make sure the sections will cover the size of any of the nails. Pour some alcohol into a little cup and dip your nails in it. Or you can use water instead. The writing will be lighter if you use water. Take the nails out and press the little piece of newspaper on your nails. Press it so carefully so that it doesn’t move. The slightest move will smudge the writing. When the writing is transferred to the nail surface, apply a top coat to protect the newspaper nail art. Almost all the newspaper nail art is similar in terms of the look. Some words are written on a white canvas, that’s the main feature of a newspaper nail art. But, you can add diversity to the art by applying any designs from the following list of designs. This is the basic design of newspaper nail art. Just place a piece of newspaper on the nails and transfer the words to the nail plates. You can follow the news of your heartthrob heroes by wearing this design. Cut the small piece of the news that is about your celebrity crush and apply it on your nails. You can draw a heart to show your love. If you have a habit of papercutting, you can foster that on your nails. This is more customized as you can choose the words as per your choice. Choose the desired words and cut that specific part of the newspaper and place them on the nails. Seal the design with a top coat. You can have newspaper nail art without using any kind of nail art. Nail art decals are the best choice in this regard. They are available in cosmetic shops. Or buy these fake nails and have stunning newspaper nail art. This design is very interesting. A newspaper doesn’t publish only news, they also publish different comics series to satisfy the need for the readers. You can paint your nails with your favorite cartoon character from the newspaper. The process is all the same. Just choose the piece of the newspaper wisely. You can use nail art decals/stickers while doing newspaper nail art. This will allow you to have newspaper nail art where the words are written in different fonts. This is innovation at its best. Apply the newspaper nail art in such a way that resembles burnt newspapers. You’ll have some real looking burnt newspaper nails which will amaze everyone. Word puzzle is an integral part of a newspaper. You can apply that particular section of a newspaper on your nails. Place the cut piece of a newspaper that contains a word puzzle to have this type of nail art. If you love a movie or book so much that you want to carry an important news about them on your nails, this is the solution for you. Here, a news of Harry Potter movies has been demonstrated for your convenience. There are no hard and fast rules that you have to cover your entire nail with newspaper. So, try something different like this picture. You can keep the lower edges of the nails blank or draw some stripes to add diversity. Be very careful while doing newspaper nail art. You have to press the piece of newspaper firmly on your nails. Any unexpected movement will ruin the entire design. Also, notice the words you are transferring to your nails. Try to choose decent words that will enrich your personality. Hope you can find the best fit for your nails.